A friendly, ‘with it’, and welcoming older person is seeking a mature, friendly and reliable Sharer for their home to give them a mix of 15 hours’ practical help and company each week in exchange for the low-cost accommodation. This person would really benefit from the reassurance of having someone around their home in the evenings/overnight, plus some additional company and practical help with errands and cooking. 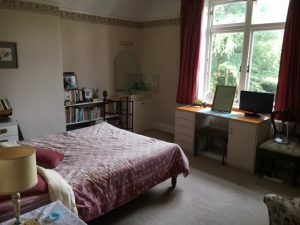 The accommodation on offeris a good-sized double bedroom furnished with a double bed, desk, wardrobe and shelves and with beautiful garden view, shared bathroom and shared used of the home’s facilities. The property is in a lovely, quiet and safe residential location in Sheen, just 400ms from shops and the Upper Richmond Road which has regular buses to Mortlake (0.7 miles) and Richmond (Tube/BR 1.5 miles). The elderly person is bright and enjoys the news and reads a newspaper daily. They also have a keen interest in antiques. They would enjoy some home cooking such as shepherd’s pie, macaroni cheese and curry. Ideally someone that shares some of her interests would be great. The ideal Sharer will be a female non-smoker who speaks very clear English (the person is profoundly deaf but is able to hear clear English and also lip reads).